You are a budding gardener. The snow has just melted, and you're ready to start planting your new garden. Armed with a to-do list and an upbeat attitude you get to work. 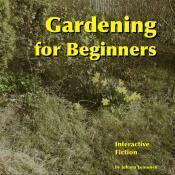 Gardening for Beginners (Juhana Leinonen; 06-Apr-2008; Z-code). Gardening for Beginners (Juhana Leinonen; 12-Apr-2008; Z-code). Gardening for Beginners - game website.